Telling the truth about the Northern Ireland conflict would narrow the space for permissible lies, it has been claimed. 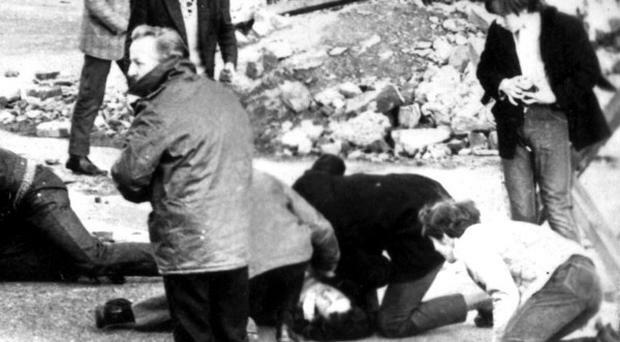 The Bloody Sunday Inquiry's role in helping dispel myths and proving the innocence of those shot dead provides a precedent, legal expert Kieran McEvoy said. He added that compelling people to give information should be accompanied by greater protection of their rights. The professor wrote a report on dealing with the past which was published today. "Let's not be overly ambitious on truth. It narrows the space for permissible lies," he said. "It is a more pragmatic approach to it which says that the problem in this part of the world is that people have two or three conflicting narratives or versions of the past and part of it is to interrogate that with some rigour." Freedom from prosecution could be offered in exchange for something like participating in a truth commission, or it would be difficult to persuade people to testify, Prof McEvoy added. How to deal with those incriminated by evidence given during hearings would also need to be addressed, such as the extent of immunity from prosecution, or witnesses could be inhibited in naming others involved in illegality like shootings or bombings. Prof McEvoy authored a report from the Healing Through Remembering organisation, Dealing With the Past, which discussed inquests, the Historical Enquiries Team, the Disappeared and the positions of the political parties on dealing with the past. It outlined five options including creating an organisation to clarify aspects of the past, a truth commission and community-based truth recovery using a series of localised hearings. While a historical commission without power to compel witnesses, grant amnesties or order prosecutions might not meet the needs of victims, a truth process with such measures could help document individual and broader institutional events, the report said. Prof McEvoy, a Queen's University Belfast professor of law with a special interest in transitional and restorative justice methods, said t he Saville Inquiry narrowed the space for permissible lies about the culpability of those who died. The civil rights protesters shot dead or injured by paratroopers in Derry in 1972 were found to be innocent. The phrase narrowing the space for permissible lies was coined by a Canadian expert in divided societies. Prof McEvoy added: "If you test the claims that are made by the protagonists with some rigour you can come to a view where it becomes more difficult to assert lies. "It is more of a pragmatic rather than a visionary version of the truth and narrows the space where people can put out versions of the past which they cannot stand over." Other options for addressing the past outlined in the report include doing nothing. The review noted, in the context of the Richard Haass-chaired all-party talks, that Sinn Fein, the SDLP and Alliance broadly favour a truth recovery process. The DUP policy of establishing an oral and video archive for victims and survivors of the Troubles appears largely uncontested by the other political parties, while all sides support measures to help victims of past conflict. While truth recovery has been questioned by unionists, the report said there does not appear to be outright opposition. Rather, there is a widespread cynicism about whether such a process is feasible and whether others, particularly republicans, would give truthful accounts of their pasts. The report noted Stormont deputy first minister Martin McGuinness has repeatedly said if a truth commission was established in which he had confidence, he would give a full account of his history in the IRA and urge other republicans to do the same. It said without a truth commission and some form of amnesty it was difficult to see how Sinn Fein president Gerry Adams could admit previous membership of the IRA without leaving himself vulnerable to prosecution and a two-year prison sentence.